Free Syrian Army Rebels shown to torture and violently murder its opponents. It has come to light that the Free Syrian Army rebels are not just the victims of Syrian President Bashar Al-Assad's regime. They are also perpetrators of violent crimes, torture and murders themselves. Walid Shoebat, a former Islamic terrorist, has made it his mission to expose what is going on in the Arab world by translating articles into English, and to bring photographs as well as videos posted on Youtube and other media sites by Arabs who post in the Arabic language. Most Westerners do not know Arabic and therefore are missing a wealth of information posted on Arabic web sites. In an interview with Arutz Sheva's Tamar Yonah on her News & Views radio program, Shoebat described the atrocities taking place in the Islamic world. In graphic detail, he spoke of the rapes and kidnappings of Christian Copts in Egypt. He provided to Yonah the video & audio of the mother of a young woman, 'Mary', who was kidnapped by the Muslims and sold to an Egyptian car salesman. The mother was filmed at a demonstration attended by the Coptic community. In the video she is shown crying and begging for the return of her daughter. Coptic families are often fed a story that their missing daughters actually ran off with the Muslim man because they were in love and that their daughter has converted to Islam of her own free will. Her mother cries out that if this is true, Mary should be allowed to come out and say so herself. Shoebat told Yonah that any serious government investigation into the matter of kidnappings of non-Muslims in Egypt is futile, "The government and the security forces do not interfere, because a Muslim kidnapping a Coptic girl ...he force-marries her, and now she is married to a Muslim, and by Sharia law, ...the Egyptian security forces don't do anything." When wanting to know more about the kidnapping story of 'Mary', Shoebat tells Yonah, "Tamar, you have to watch it (the video) you cannot be 'told' about it, you have to watch it." Yonah then plays the dramatic audio on the program for the listeners to experience the emotional trauma experienced by the Coptic community in Egypt. You cannot be 'told' about it, you have to watch it. 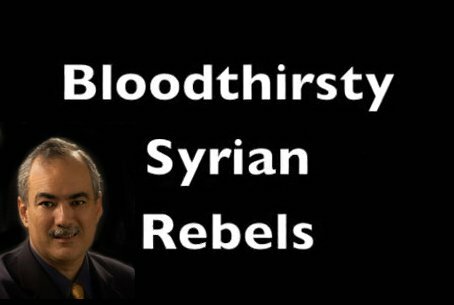 Shoebat's son, Theodore Shoebat, has just compiled together a series of videos in a short 13-minute film entitled 'Bloodthirsty Syrian Rebels'. The video shows several scenes of atrocities and crimes against humanity carried out by the Free Syrian Army on other Syrians. Shoebat told Tamar Yonah that some of these clips in the video showing beheadings, executions, and body defilement were taken from the cell phones of the Syrian rebels after their capture by government forces. Often times, the bodies of the victims were tossed into sewers, which Shoebat stated, were filled with excrement. The situation is intolerable for people living in Syria, Egypt, or any other place where the Arab Spring has taken root. Shoebat says that for the average person, they have two choices: "The Party line, or the coffin - or in this case, the Party line or the sewer." With the Obama Administration's more than tacit support of the Syrian Rebels, it is vital that these atrocities of the Free Syrian Army be exposed. Shoebat's film, 'Bloodthirsty Syrian Rebels', is extremely graphic and cannot be shown on most television media outlets. According to Shoebat, after posting it on Youtube, it was subsequently removed. He has since, only been able to host it on his website, but has released the film to Arutz Sheva. WARNING: This video is extremely graphic. To hear the radio interview with Walid Shoebat where he supplies more of the details and explanations of why little, if anything, is being done to stop these crimes, click HERE. The Tamar Yonah Show covers the news of the day, as well as interviews respected authors, journalists, and politicians about the burning issues facing Israel and the Western World in our age of globalism. She also hosts a segment called, 'The Arab Report' with former Muslim Arabs, who blow the whistle on what the Arab Muslim world is saying - in Arabic, as opposed to what they tell you in English. The program airs live Sundays 3pm-5pm Israel time / 8am-10am US eastern time. Also every Sunday, Monday and Tuesday evening at 9pm Israel time / 2pm US Eastern. Call toll free from the USA/Canada/Israel at 1-888-780-2425. For the Tamar Yonah Show podcast archives click here.